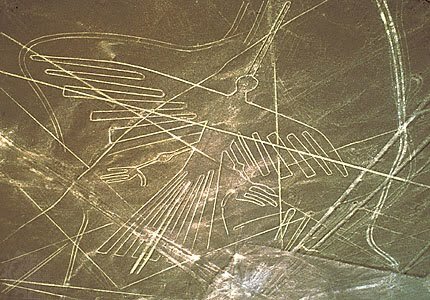 The Nazca lines are in the Nazca Desert in Peru. The one pictured above is my favorite looking one. 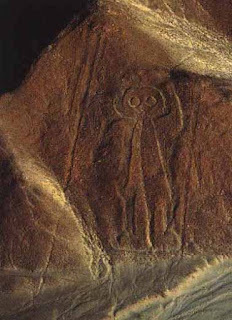 These figures have been carved into the ground to be obviously seen from above. An ancient civilization of people developed these glyphs. The purpose is still unknown. Even the locals that live in the Nazca area have no idea what these things were used for, or if they had a grand purpose at all. This Nazca picture shows a picture of what looks like an astronaut with a helmet and everything. These pictures can still be seen from Google Earth. Did aliens visit our planet in the past and request these things be built? This must have taken a ton of precision and measuring equipment, and i do not believe all this was done by eye. 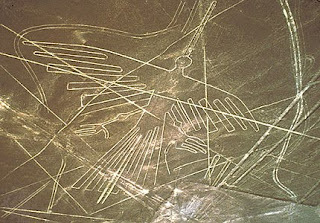 This picture is also from Nazca Desert and looks like a Phoenix or some type of bird that has been etched. Is there some type of significance between these pictures and today. Whoever built them definitely wanted to make sure that they stood the test of time.